While there are few countries more fascinating than India, there are also few countries more difficult to get around. Highways can be virtual free-for-all's, and driving through cities may require dodging waves of pedestrians and wandering cows -- not to mention all manner of vehicles from careening cars to wooden pushcarts, each trying to claim its share of the road (i.e., all of it). It's chaos on wheels, and eventually you get to where you're going, unless you don’t. Train travel is a step above, but – sometimes overcrowded to the point of overflowing -- can be almost as trying at times. That's all part of the fun of traveling in India -- once you're able to look back on it. But imagine yourself peacefully gliding along a river in India, taking in the sights from a comfortable riverboat. And not just any river: The newest entry into the burgeoning Asian river cruising market is the Ganges, India’s most famous -- sacred to Hindus and offering riveting views throughout its 1,500-mile length. You can now spend up to eight days cruising the Ganges, and enjoy some of the sights of India from a brand new river ship. Assam runs Ganges cruises of four to eight days from Kolkata (Calcutta) and other embarkation points. Some include the fascinating holy city of Varanasi (see below) if water conditions permit. And now, because the Ganges is the big enchilada -- make that the big samosa -- of Indian rivers, American-based cruise lines are entering the competition. Vantage Travel is the first American operator to offer week-long Ganges cruises, aboard the new all-suite ship RV Ganges Voyager. The cruises are part of longer 19-day India tours that include the "Golden Triangle" cities of Delhi, Agra (home of the Taj Mahal), and the "Pink City" of Jaipur, so you'll get to experience all the excitement of Indian land travel as well. Once on the ship, which boards at teeming Kolkata, you can take excursions to towns, temples, monuments and villages that lie along the river as it winds northwest. Vantage is calling its tours "Exotic India & the Sacred Ganges." In January 2016, the upscale line Uniworld enters the picture, with eight-day Ganges cruises aboard the new and luxurious Ganges Voyager II, part of a 13-day land-river package that also includes the Golden Triangle cities. 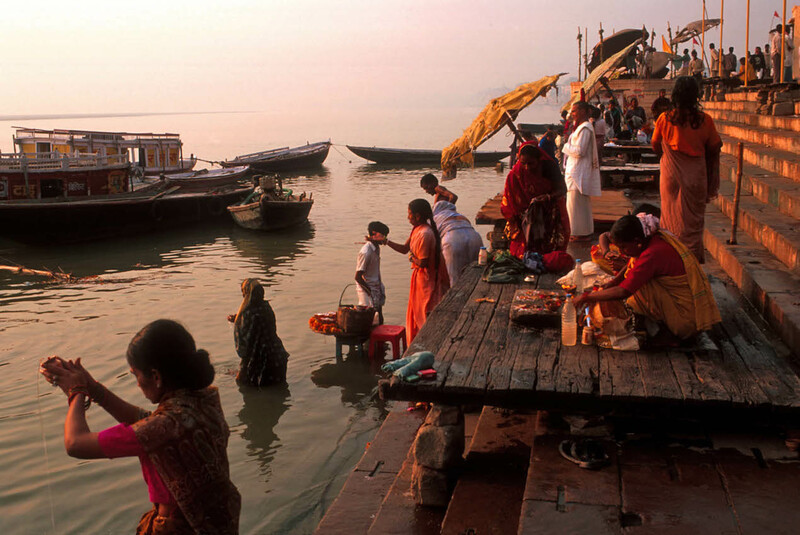 Uniworld calls its tour "India's Golden Triangle & the Sacred Ganges." The itinerary starts in Kolkata and includes stops at Kalna, Matiari, Khushbagh, Mayapur, and Chandannagar, all in northeastern India near Bangladesh. If your cruise doesn't already include it, consider extending your trip to visit the holy Hindu city of Varanasi, where the devout come for ritual bathing in the Ganges to cleanse themselves of their sins. Get there at dawn if possible, to see the sun rise on the huge ghats -- some used as steps down to the river, others for cremations -- and the colorful parade of sari- or loincloth-clad bathers washing in the Ganges. It's an unforgettable sight.